Dave Lawson is available to DJ for events of many occasions. 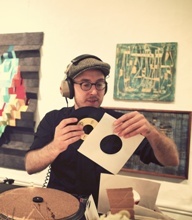 He has played records at the Masonic Temple, the DSO, The Motor City Casino, Cobo Center, Leon and Lulu, Belle Isle, The Rustbelt Market, as well as countless weddings, corporate events, private parties, and various venues in the area. If you're interested in having Dave DJ at your event, don't hesitate to contact him and see how he can help you out.